Recently I was asked to team up with Borrowed & Blue, an online wedding resource for couples, for a little Q&A session. Borrowed & Blue asked some great “Getting to know your Planner” questions which is also a fun and exciting way to see how you will connect with your planner, both personally and professionally, when deciding who to trust with your special day! Read on to get some behind the scenes info from yours truly! And thank you to Borrowed & Blue for reaching out to learn more about Carolyn Wilson Weddings & Events! B&B: If you could possibly narrow it down, what would be your favorite moment of a wedding day? CW: There’s so many special and favorite moments, but I’d have to say seeing the faces of the couple when they see their ceremony and reception set up for the first time; Seeing how happy they are with how I was able to translate their vision into a reality. B&B: Describe your event aesthetic in three words. B&B: The first thing you ask when you sit down with a couple? CW: It varies—but I usually like to ask them to tell me more about themselves, how they met and who proposed, and of course about their wedding day vision, the feeling they want to have during their wedding and what they want themselves and their guests to remember after their wedding day! B&B: Top three pieces of advice for couples who just got engaged? Take time to focus on each other and not always on the wedding/planning/details (go on a date and don’t talk about the wedding….at all! I’ll be biased and say to hire a wedding planner—don’t be afraid to do so. If you hire a good one, and the right one, you will not only enjoy the planning process, but you will also be able to still ‘plan’ your wedding with the help of a seasoned professional—one who lives, eats, and breathes weddings and is a priceless and valuable resource for all your planning needs! B&B: Most important detail of wedding decor? CW: Your wedding decor should be personalized to represent the couple as a whole and not just one or the other, and that it be cohesive throughout the entire event. It doesn’t have to be ‘matchy-matchy’ by any means, but it does have to make ‘sense’ to everyone—including the couple and their guests. When in doubt, hire a planner who also offers design to help collect your thoughts and narrow them down to what will represent the couple and their overall vision on their wedding day! B&B: Your thoughts on DIY weddings? CW: As personalized as a DIY wedding may be to a couple, it can also be more work and more costly than expected. They can be great in some aspects but the time it takes to try to DIY some of the larger (and even smaller) aspects of a wedding, can take away from enjoying the overall experience of planning. It may add undue stress to the couple with having to complete all the small (and at times, large) projects that could have been hired through a professional who does them all the time. Hiring someone who does this day in and day out will allow the DIY feel to come across in a professional manner. A couple can still incorporate some DIY elements into their wedding like incorporating part of your Mother’s dress into your own, or into a part of a gift like a personalized handkerchief for your Father to hold in his pocket, or to bring in old family photos of past weddings to place at a welcome table. DIY works really well with smaller more intimate settings like baby showers, bridal showers, birthday parties and even anniversaries where more people can be involved. There is potentially less stress on each party involved by delegating different aspects of the DIY projects at hand as well as incorporating that DIY look and feel to the event. B&B: What would your ideal tablescape look like? CW: For me personally, my ideal tablescape can get very detailed—and of course this isn’t the ONLY look I like—but a general tablescape that I love would include colors of ivory/white, blush, taupe, and metallics (a mix of golds and silvers). I love clean white florals like Phalaenopsis Orchids, Calla Lilies and Hydrangeas set loosely in clear glass vases with hanging crystal elements, and TONS of lit votives and floating candles. All of this designed into an interesting, somewhat modern yet still timeless and classical combination down the center of each long guest table. 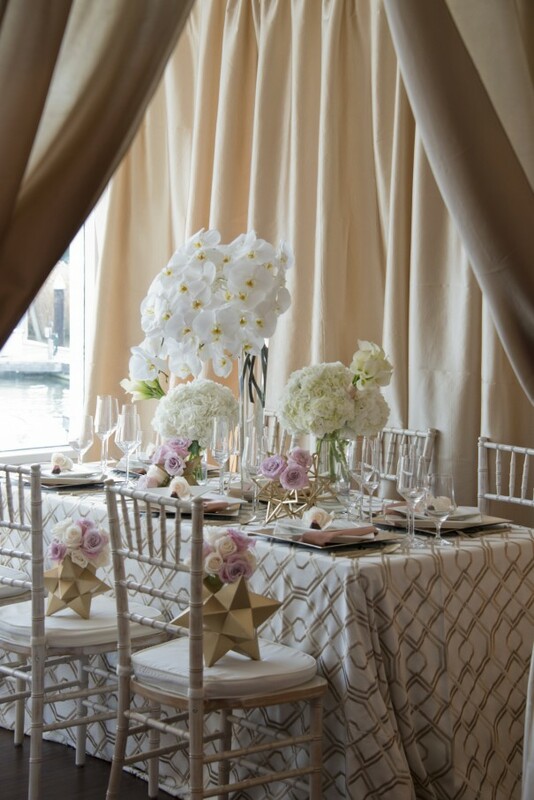 Coordinating and complimentary light color table linens with a clean design embossed or woven into the fabric, glass chargers, modern flatware, timeless glassware, and classic china would be used to tie in the romance, personalization, and sophistication I like to exude. Of course we cannot forget the custom menus, place cards, interesting napkin design, personalized favor and last added touch of either a floral or edible element to top off the place setting. B&B: Your favorite of all the San Francisco wedding venues? CW: Again hard to have a favorite as each venue brings something unique and special to each couple and their event, but if I had to choose one I would say that I love the cleanliness and sophistication of spaces like the Bently Reserve….ok and City Hall…. and the War Memorial Opera house….can I keep going? B&B: The most important part of wedding planning? CW: Trusting your planner and any professional vendor or service provider who does their job day in and day out. If they are tried and true, professional and have integrity, then you have nothing to worry about. Referrals are always key and a planner knows just who to refer you to as well as what to suggest if something doesn’t seem to fit quite right. When you trust your planner, who has your best interest at heart, the planning process becomes more enjoyable. B&B: Describe your dream wedding. CW: This is truly a hard question to answer, being that I love so many different aspects of so many different weddings that I have helped plan and design that I would love to personalize and call my own. I can see myself having the 500 person all out dance party and at the same time I can see myself having a very intimate 50 person gathering with my closest family and friends. Honestly, I’d love to get married once a year not only to renew the vows with my husband (because that is ultimately the reason for planning and designing something elaborate or intimate in the first place) but to be able to plan and design something different each time, as I’m sure our tastes and styles would change over time and we would want that to be reflected in our wedding(s), that I know I and my husband would enjoy and be able to look back on fondly. Book Carolyn Wilson Weddings & Events for your event today! Thanks again to Borrowed & Blue for the Q&A! 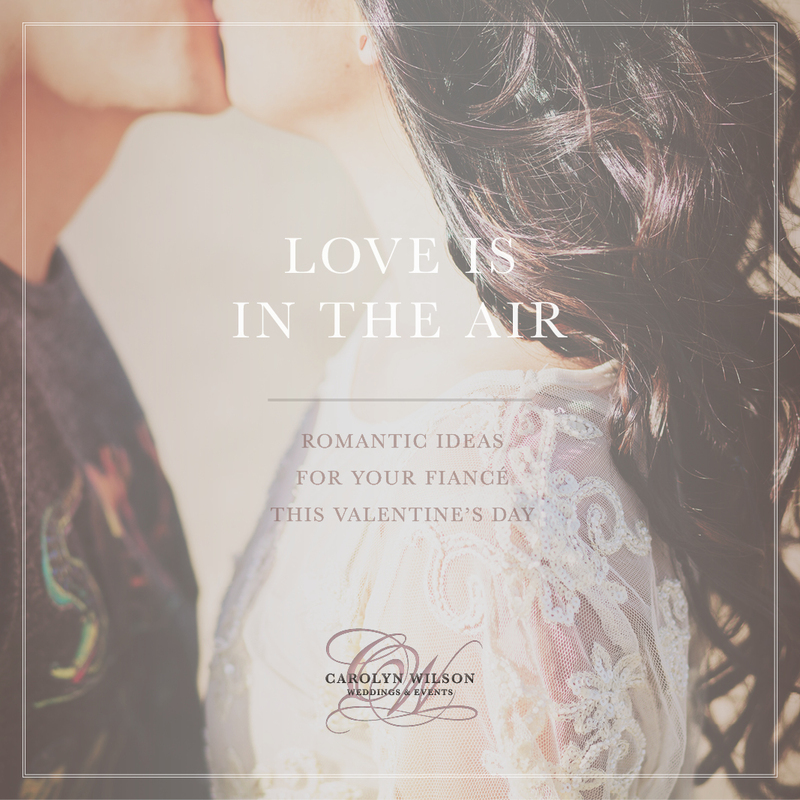 Write a love note: take time this Valentine’s season to write a sincere love letter to your fiancé. When wedding planning gets overwhelming, he’ll love having this special treasure to remind him of your love. Even better? Write another note, dated February 14, for him to open on your wedding day! Don’t forget to seal both with a kiss. Surprise him with a spontaneous getaway! Even if you only have one day to celebrate, whisk him away on a spontaneous adventure. Drive to a local bed and breakfast, or visit a park outside the city limits. Do something outside your routine to spark a romantic air of excitement for the whole day long. Go all-out on décor: while it may seem like he doesn’t take interest in décor on a regular basis, he’ll be sure to take notice of wow-worthy décor this Sunday. Pull out all the stops for your Valentine’s dinner table if you’re eating at home… candles, roses, glass vases. Layer decadent textures with a tablecloth or runner topped with lush greenery and blooming buds. If you’re going out to dinner, you can still make your home a Valentine’s dream with rose petals and twinkling lights that set the mood for a romantic evening. No matter how you celebrate, just make sure to enjoy each other’s company. This Valentine’s day is a special one, and you deserve to share a romantic day together. To continue the romance, feel free to get in touch and see what our San Francisco wedding planner service can do for you. We would love to plan a wedding that encompasses your unique love story, down to every last detail. 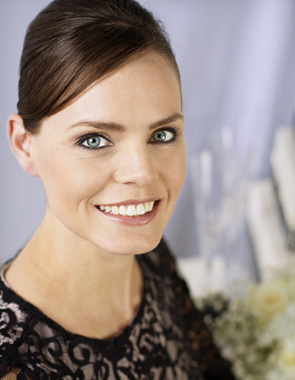 Best wishes to all our Carolyn Wilson Weddings and Events couples, past and present!